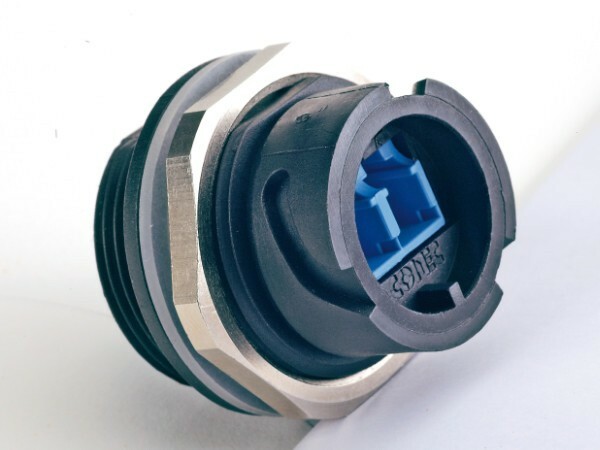 In2Connect has advanced its water-resistant series of IP67 connectors to include fibre-optic duplex LC connectors from Conec. These connectors are bayonet locking for reliable coupling in harsh interior or outdoor environments. These IP-67 rated connectors allow designers to incorporate data ports in the most challenging harsh environments, such as WiMax, Long Term Evolution (LTE), and Remote Radio Heads using Fibre to the Antenna (FTTA) connectivity. Ideal for communications, security and surveillance equipment applications, the connectors provide increased protection from contamination and moisture in addition to mechanical stability, temperature resistance and vibration immunity. Optical Fibre systems are immune to heavy sources of EMI. The need to send high-speed data across harsh environments has forced designers to rethink the cabling and connector interfaces they use. With data speeds and data volume pushing the limits of Ethernet, more applications are requiring fibre optics.Until now, there were very few sensible choices of outdoor fibre-optic connectors. Designated the LC Series, CONEC offers the broadest ODVA-compliant fibre-optic connector portfolio in the industry, providing both full-metal and plastic versions of the IP67-rated interconnects. The Conec extensive ODVA-compliant product portfolio gives customers design flexibility, and ensures that FTTA systems meet telecommunication industry standards as well as harsh environment requirements. In addition, CONEC can provide cable and plug kit assembly services to deliver a complete FTTA systems interconnect solution. For enhanced performance, Conec also included a Multi-Mode 50/1µm (300 metre 10GbE – OM3) cable option. The IP67-rated LC product family features a 1/6th turn bayonet coupling for fast and secure mate/unmate, even with gloved hands. To optimize chemical resistance, UV resistance, and tolerance to physical abuse. We offer these connectors in two different housing materials: black plastic and nickel-plated, zinc die-cast. All connectors are duplex LC type, in single-mode, multi-mode, and APC types. The product line includes panel-mounted receptacles, mating plugs, and protective caps. Pre-assembled jumper cables including cables suitable for outdoor use and direct burial, in standard lengths from 1 metre to 300 metres are also available. The IP67 LC connectors ensure a continuously secure connection and are dust proof and weatherproof, with a silicone ring seal that makes a watertight connection to the panel. They are not intended for use under continuous pressure. In consideration of the broad range of ‘rained on’ definitions, the industry appears to have agreed to a ‘test of immersion for 30 minutes, at a depth of 1 metre, or the equivalent air test at 1.45 psi. That is the Qualification Test. (Protected against the effects of temporary immersion between 15cm and 1metre. Duration of test 30minutes). Secure, sealed interconnection will withstand severe shocks and vibrations and is IP67 sealed.